South Dock on Providenciales. Nearly all cargo into the Turks and Caicos arrives at this port. 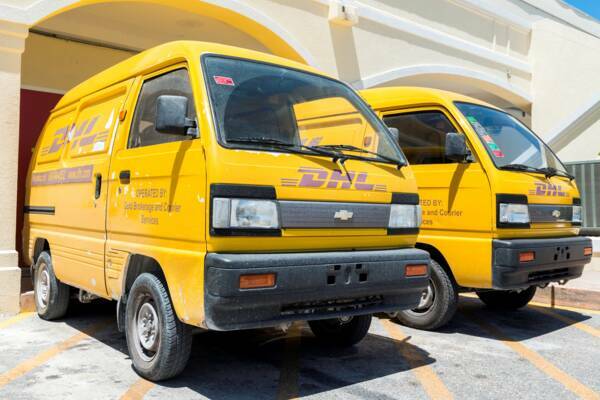 DHL delivery vans on Providenciales. Several of the local parcel services offer delivery to commercial addresses. There are several options for posting and shipping goods to the Turks and Caicos, and rates and transit times vary widely depending on the service used. It’s important to have a complete understanding of total applicable costs when importing goods into the Turks and Caicos, as costs add up quickly and are typically higher than what may have been initially expected. Due to the high cost of air parcel services and slow transit times of the postal service, many locals opt to use a freight forwarder when importing goods. Generally, for speed you’ll want to use a courier such as FedEx or DHL, for medium-sized shipments (up to several cubic feet) you’ll want to use a mail consolidator/freight forwarder, and for large shipments a LCL (less than container load) from one of the main shipping agents. Customs duty must be paid on most goods imported into the Turks and Caicos, and a customs processing fee is also required in all situations (unless a waiver is obtained in special circumstances). Customs duty in the Turks and Caicos is 30% of value for most items. There are lower or no duties on some goods such as books, some food products, and energy efficient and “green” items, and higher rates on luxury goods, alcohol, and passenger vehicles with large displacement engines. A 7.5% customs processing fee is additionally applied to goods shipped into the Turks and Caicos. This is still the case on 0% or exempt items (again, unless a special waiver is obtained). In addition to the customs duty and customs processing fee, shippers and customs brokerage firms typically charge a clearance fee. For small shipments from services such as DHL, FedEx, or UPS, this is typically in the range of an additional $10 to $25 fee. For larger and LCL shipments, or those via a customs broker, the fee can be over $70. The government has limited the ability of private persons to apply for and obtain customs clearance, leading to the rise of agencies that specialize in the service. Residents and visitors arriving by air in the Turks and Caicos have a $400 customs duty exemption, so it’s a common local practice to take short shopping trips to Miami or Fort Lauderdale to shop for clothing, personal goods, and electronics. The typical duty rates are paid on goods that exceed the personal exemption. See Customs Allowances. The Providenciales to North Caicos cargo barge. Building on the less-populated islands can be difficult due to limited available transport between islands. The Turks and Caicos Islands Postal Service has post offices on all main inhabited islands in the country. Rates and transit durations of mail and packages shipped to the Turks and Caicos vary widely. In many cases, actual transit times to the Turks and Caicos are much longer than what is quoted at point of origin post office outside of the county. Local post offices in the Turks and Caicos typically collect any customs duties due on pick up. FedEx, DHL, and UPS have established offices on Providenciales, and provide shipping services into and out of the Turks and Caicos. Several other international parcel service entities have agreements with one of the local parcel services to handle distribution in Turks and Caicos. For example, FedEx distributes TNT shipments. There are now several freight forwarders and mail consolidators that operate in the Turks and Caicos, and these services have become very popular with local residents to their relative ease of use and cost. These agencies offer customers a United States shipping address (usually in Florida) for mail and less than container load cargo, combine many small shipments into a full container load, and then forward the cargo to the Turks and Caicos. There’s typically a 2-3 week delay between when the shipment was delivered to forwarding facility in the United States and when it’s ready for pickup on Providenciales. Some forwarding agencies have begun to offer a faster air service as well, albeit at much higher rates. Two ocean fright shipping lines, SEACOR and Tropical Shipping, operate container cargo vessels between the Turks and Caicos and Florida, and nearly all cargo imported into the country arrives through one of these two companies, typically via standard steel shipping containers. Both of these fright lines offer less than container load shipping, where goods from multiple customers are combined to fill full shipping containers. Customs clearance may be handled by either the shipping line or an independent broker. Less than container load shipping is the best choices for heavy and bulky items that don’t justify a full container. SEACOR and Tropical Shipping provide transport services for 20 foot and 40 foot shipping containers. Customers may opt to have their own container (if certified for ocean freight) shipped, or rent a container from the ocean freight company for the journey. Rented containers may be unloaded at the shipping line’s facilities, or the container can be transported on island to an offsite located to be emptied. Full container load shipping is the least expensive shipping method to the Turks and Caicos by volume. It’s often the best option when building or outfitting a home in the Turks and Caicos. The FCL shippers and some of the freight consolidators offer refrigerated shipping, via refrigerated containers. In some cases, the courier parcel services can accommodate insulated packages or coolers packed with dry ice. For shipments to Grand Turk, there’s a weekly cargo service between Government Dock on Grand Turk and South Dock on Providenciales. For South Caicos, there’s a similar weekly schedule from Providenciales and the main port of Cockburn Harbour at South Caicos. 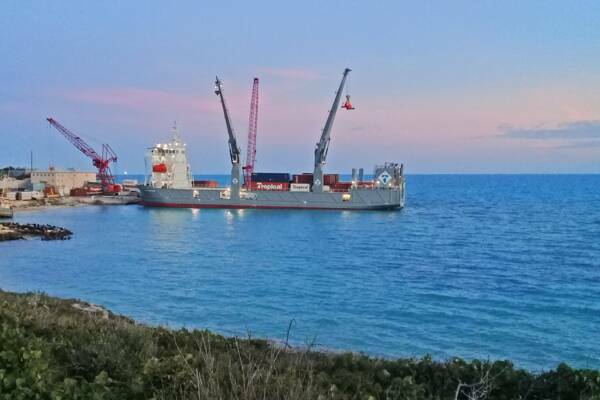 The cargo needs of North and Middle Caicos are serviced primarily via the Lew 1 barge, which travels the relatively short journey between Heaving Down Rock on Providenciales and Bellefield Landing on North Caicos. South Dock on Providenciales is the nation’s busiest port and handles more than 85% of the national port traffic (2012 government data). This is a small port and only ships of around 110 TEU in size (twenty-foot container equivalent unit) can berth here. Draft is also quite shallow at around 11 ft (2017). Tropic Freedom at South Dock. This unique vessel was built in 2018 and designed for shallow draft ports. Shipping prices in the Turks and Caicos tend to be higher than at other regional countries. This is largely due to both the shallow depth ports in the Turks and Caicos, and the limited relative quantities of goods being shipped into the country. Due to the water depths surrounding local ports, specialty shallow draft vessels must be used, which have limited cargo capacity and higher operating costs. Consequently, Tropical Shipping, a U.S. based freight line that services the Turks and Caicos, commissioned the Tropic Freedom. This 2018 cargo vessel was built in China and has a capacity of 306 TEU, which is substantially greater than the 157 TEU of typical other vessels used locally, such as the Tropic Opal and Tropic Night. 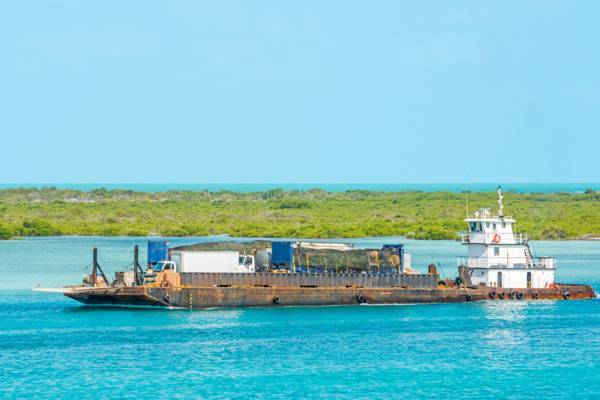 A 15-year monopoly was granted to Provo Stevedoring Ltd (PSL) for exclusive operation of stevedoring operations at Providenciales and Grand Turk. As a result of this Government imposed monopoly, the cost for offloading a container increased from $80 to $350 (data from TC Weekly News). The overall cost for shipping a container from the Port of Miami to Providenciales (around 575 miles) is more expensive than shipping a container from the US to Asia (5,000 to 6,000 miles).